Fired Up Ceramics specialises in the slip casting method, a technique for the production of pottery and ceramics not easily made on a wheel or items that cannot be formed by other methods of shaping. This technique is suited to the production of complex shapes and is commonly used for sanitaryware, such as toilets and basins, plus smaller pieces like figurines and teapots. It can also be used for small-scale production of items or to produce limited editions of objects. 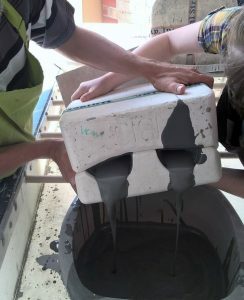 A liquid clay ‘slip’ is poured into plaster moulds and allowed to form a layer. This is called the ‘cast’. The clay covers the internal surface of the mould which is absorbent and will begin to draw water from the casting slip. The longer the slip sits in the mould the more water is drawn from it and the thicker the casting becomes. 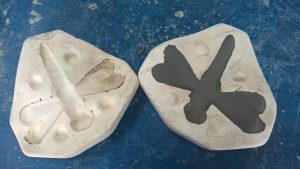 Excess slip is poured out of the mould and the remaining ‘skin’ left in the mould is the casting. It will continue to dry, and eventually shrink away from the mould. 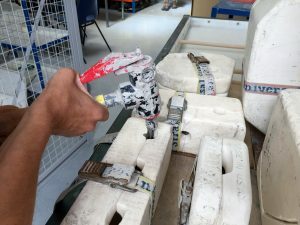 When the casting is firm enough to be removed from the mould, we take the casting out of the mould to let it dry, or assemble it with its corresponding parts, for example, handles, spout, feet. The cast piece is now ready to be ‘fettled’ (trimmed neatly). This is called a ‘greenware’ piece which is then allowed to dry fully before firing. Once a greenware piece has been fired, it’s called ‘bisque’. The item has been transformed into a porous state ready for painting and glazing. Decorating with paint or glaze is the final stage of some pottery making. 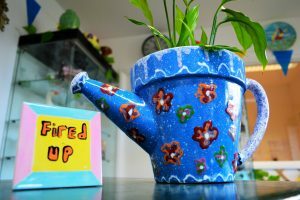 The item can be decorated in several ways with a wide range of paints and glaze. Finally the glaze is added to make it waterproof for liquids, and suitable for outdoor use. At this stage the object is complete and ready to be ‘glaze fired’, which causes the glaze material to melt, then adhere to the object. 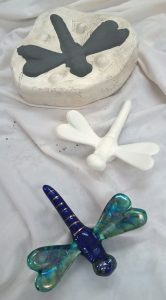 The glaze firing will also harden the object further. And there you have it, the process we use to make ceramic bisque, from start to finished product.